You are currently browsing the tag archive for the ‘Saltire Cup’ tag. 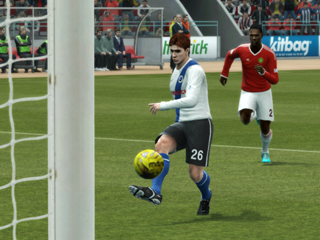 Conor Meldrum can’t believe that goudi keeper Giuseppe Brichetto has blocked his net-bound shot. Brook Street bowed out of Cup football for another season following this morning’s 2-0 defeat away to goudi city in the Saltire Cup. Far from being downbeat at his side’s third defeat on the bounce, Eike Alanne was heartened by the team’s display against one of the giants of Scottish football. “We tried out a few things; some worked, some didn’t, but I couldn’t fault the players’ workrate and attitude. Both were excellent”. We conceded two sloppy goals; for the first, the lad should have been closed down; and we didn’t deal with the build-up to the second. We have clearly got a lot of work to do with the defenders”. He continued, “Owen Maurice came in and acquitted himself very well between the sticks; one save was truly outstanding. He’s now knocking at the door for a starting place on Saturday. Henny van Wegen also made his debut, and showed some nice touches despite having a quiet game. I feel he’ll do well for us”. However, admitting that there was no room for complacency with fixtures coming thick and fast, he said, “We’ve no chance to rest up though as we’ve got a really big game on Saturday against Loch of Harray. They look like a really big strong side and have made a terrific start to the season, so we’ll have to up our recent performances to take anything from the game”. So it’s back to midweek friendlies for Brook Street now, although the coach doesn’t see that as a bad thing. “Having non-competitive games midweek probably suits us better and allows us to focus on and build up for the more important league games at the weekend. We can try things with the pressure off, and try different players in different positions. That’s a win / win as far as I’m concerned”. 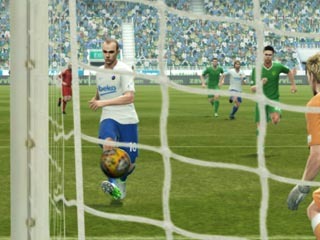 Andrew Cleary fires in our shock equaliser. We would however only be level for two minutes. Eike Alanne had been looking for a positive response from his players following Wednesday’s disasterous performance in the Cup, so this afternoon’s 4-1 reversal at the hands of Eliminators Kushevo was clearly not what he was hoping for. Despite being under the cosh for the bulk of the game, Brook Street went in at half-time only trailing to Cosmin Ploesteanu’s fifteenth minute strike. Andrew Cleary levelled in the sixty-sixth minute very much against the run of play, giving hope that Brook Street were about to inflict another ‘smash and grab’ raid on a side that were playing them off the park. However, it was not to be as two Dániel Pálvölgyi goals were added to by Emil Brorson ten minutes from time to give the scoreline a slightly more balanced view of proceedings. 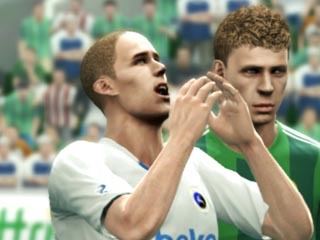 Once again Brook Street’s defensive frailties came to the fore as Eike pointed out after the match. “We gave away stupid goals; goals which could have been prevented”, he said. “We defended reasonably well in the first half, but after they went 2-1 up, the writing was on the wall for us”. Alluding to the fact that he may be in the market for defensive players he added, “We can’t go on like this. We’re shipping far to many goals, and that’s the area of the pitch that concerns me most”. “We lose concentration far too easily, and in this league, that is fatal. I need one or two old heads in defence to keep them focussed”. Brook Street’s defeat, combined with Lion OD’s 1-0 defeat of Arci Turano sees the pressure build on the New Home Parks side as they slide back down to the foot of the table. With a potentially very difficult tie against new boys Loch of Harray coming up next weekend, it is vital that the club sort out their defensive issues, and fast. 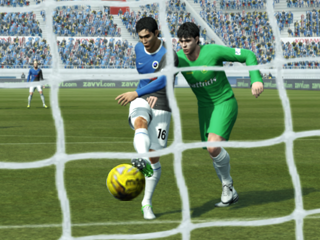 Before that however, is the minor problem of a match away to goudi city in the Saltire Cup. Sam Ferretto hits the ball low and hard into the chain of beer net to open the scoring. Brook Street’s record breaking run in this season’s Saltire Cup came to an end at The Bloated Dome this afternoon when they were defeated 2-5 by chain of beer. The New Home Park side had twice taken the lead; Sam Ferretto had finished off a fine through ball from Andrew Cleary to open the scoring in the eighteenth minute, and although chain had equalised six minutes later, Andrew restored the advantage in thirty-six minutes. The ‘visitors’ struck back instantly though, and hit the net a further two times in the remaining nine minutes to take a decisive lead into the break. Brook Street were a spent force though and with the writing on the wall, chain scored a fifth goal with less than a quarter of an hour to go. “We simply ran out of steam”, said Leoš afterwards. “We’d started well, but the three goals in quick succession did for us”. “It’s been a great run in the competition, and one we can be proud of”, said the coach. “Now however it’s back to the bread and butter of the league and our quest for survival. That after all is our prime objective”. He also confirmed that the reserves would be fielded in the remaining friendly matches of the season. Muhammad Noorani fires home to open the scoring and send Brook Street on their way to the Quarter-Finals. While Brook Street’s league form continues to give cause for concern, the same most definitely can’t be said for their for in this season’s Saltire Cup where today’s 2-0 win over FC Vålax took the Monifieth side into the Quarter-Finals of a national Cup competition for the first time. Naturally, and in stark contrast to Saturday, it was a jubilant Leoš Loos who attended the post-match press conference. When asked about the history-making performance, he said, “From their previous performances, we suspected they would try to ‘park the bus’, so it was up to us to break them down”. “It was a blow to lose Abel [Soffia], but Alex Clapperton came on and with almost his first touch swung in the beauty of a cross that Muhammad [Noorani] powered into the net to open the scoring. We pressed the game and got the all important second goal before half-time, and from then on the game was over”. Asked about the extent of the injury to Abel Soffia he replied, “It looks like he might be out for about a week, so that probably rules him out of the league game at the weekend. However, we’re hopeful that’s just the worst-case scenario, but I’m confident Alex [Clapperton] will do a good job”. And of his side’s chances in the Quarter-Finals? “At this stage in the competition, there are no ‘easy’ games; it’s all about tactics and who gets them right on the day”, Leoš replied. “It’s a knockout competition though, so anything is possible”, he concluded. Abel Soffia fires us into the lead for the first time and on our way to creating history. Last season, Team Europe at Gleneagles comfortably saw off Brook Street in the Third Round of the Saltire Cup, running out 4-0 winners. However it was a different story this morning as it was the New Home Park side who had the last laugh in the Fourth Round, winning 3-2. Ironically, it was the away team who netted first through Mauro Bogo in the twenty-sixth minute; a lead they held until three minutes into the second half when Andrew Cleary dispatched Garabed Palasyan’s cross. Play raged from end to end, but no one could make the breakthrough, that is until a two minute spell with twenty minutes to go when first Abel Soffia blasted in a half-volley to take the lead, and two minutes later Muhammad Noorani bundled the ball over the line to make it 3-1. Mauro Bogo netted his second of the game with thirteen minutes to go which made for a nervous closing period, but Brook Street held on to gain some revenge for last season, and create a small piece of history by becoming the first Brook Street side to reach the last sixteen of a national competition. “We only played well in spells”, admitted Brook Street coach Leoš Loos, “but the result was more important that the performance”. “Gleneagles are a good side and they’re doing well in their league, so our victory shouldn’t be underestimated”, he added. 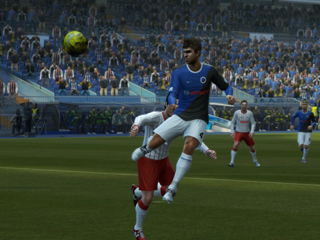 Brook Street’s reward or the win is a Fifth Round tie against Division IV side FC Vålax. “We’ve got a rough idea how they’ll line up, so without giving anything away we’ll look to counter that”, said Leoš. Andrew Cleary tries in vain to find a way through the Knights defence. After Wednesday’s heroics in the Saltire Cup, it was back to earth with a bump this afternoon as league leaders Caerlaverock Knights ran out comfortable 4-0 winners at New Home Park. There was to be no fireworks from the home side as the Brook Street challenge fizzled out like a damp squib. “We never put them under any sort of pressure which is particularly disappointing”, fumed Brook Street coach Leoš Loos. “That said, they are easily the best side we have faced so far, but that doesn’t lessen the disappointment I am feeling about our performance”. “We never put them under any pressure whatsoever; they were first to everything and they showed an urgency and desire to win that we simply didn’t have”. He added, “That doesn’t help us in our quest for survival in this league though, and a wrong result could put us in a difficult position. It’s far too tight at the bottom of the league for my liking and I want us to put more points between us and the relegation zone”. “We’re only a point off of second bottom. That’s far too close for comfort”, he concluded. Brook Street were two goals down within the first twenty minutes or so, but a late collapse saw the Knights net twice in the last quarter of an hour to give the scoreline a more accurate impression of the dominance of the visitors. Floating on air… Hachem Baddou defies gravity to power home our second goal. Prior to today’s victory over Quinta Brigada T.C., Brook Street’s best ever run in the Saltire Cup came last season when they went out in the third round to Team Europe at Gleneagles. In a bizarre twist of fate, that’s exactly who the New Home Park side will face in the Fourth Round of this season’s competition next Wednesday. “It’s a great draw for us”, said Brook Street coach Leoš Loos on hearing the news. “We made some tactical errors last season which cost us dearly. It’s good to get another crack at them so soon”. He continued, “They look like they’re on a good run, so we’ll have to be on our game. We’ve played reasonably well in the competition so far, but now we’re getting ever closer to the sharp end and it’s further than we’ve ever got before. We’re obviously got to up our game now if we’re to progress further”. While acknowledging that it was a great run, he added, “It will all count for nothing if we don’t show up next Wednesday”. Turning back to today’s win he said, “To be honest, we’re lucky to have gone through and have Zeke to thank for it. His point-blank save was world class”. “We surrendered far too much possession, and put ourselves under pressure needlessly”, he added. We must eliminate that from our game”. However, he was more than happy to praise his players’ performances at the other end of the park. “As soon as the ball broke to Andrew [Cleary] there was only every going to be one outcome, and for our second, Hachem [Baddou] has that strange ability to hang in the air which is hopefully going to produce a lot of goals for him. It wasn’t all good news though and the coach admitted that Emanuel Bohucký is facing an extended spell on the sidelines. “He took a bad one, and on top of Eliseo Alberios’s, it’s the last thing we needed to be honest. We’ll dust ourselves ourselves down and see where we’re at for the next game. 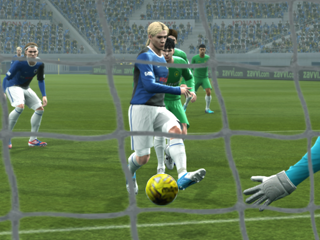 After some fine build-up play, Lope Cabrio rifles the ball into the net to open the scoring against Ants Army. Brook Street put Saturday’s bad result in the Highlands behind them this morning with an excellent 4-2 win over Ants Army F.C. to reach the Third Round of the Saltire Cup. Two quick goals around the quarter hour mark from Lope Cabrio and Eike Alanne set Brook Street on their way, and although Davide Marzuillo reduced the lead, Attila Gyöngyösi quickly re-established the two-goal advantage going into the break. Ants struck again with an hour played, Ingo Trittibach being marked down as the scorer, but Brook Street were not to be denied and Emanuel Bohucký secured the win with a fine solo effort midway through the half. “It wasn’t a classic performance”, admitted Leoš Loos afterwards, “but after the result at the weekend, getting the confidence-boosting win was far more important. We got it, and can now go forward with renewed confidence”. In the Third Round, Brook Street have been drawn against fellow Division III side, Quinta Brigada T.C. With the match scheduled to be played in Aberdeen at the 140,000 capacity Bloated Dome, home of Push It Wide, Boys!! Coach Leoš Loos, seems to have been impressed with what he’s seen of next week’s opponents, but limited his comment to, “They look like a very good side, so we’ll have to be on our game next Wednesday”. Before that though comes Saturday’s six-pointer away to Smyllum Rovers FC . Matt Cocker slams the ball into the net to send Brook Street on their way to the Second Round. A professional first half display which saw Brook Street hit five goals without reply comfortably into the Saltire Cup Second Round. Chieftans had no reply to the onslaught which saw Matt Cocker, Phil Mullally, Eliseo Albeiros find the net along with captain Fraser Carragher who netted a brace, all within the first thirty-seven minutes. This allowed youngsters Liam Christie and Lachlan MacKinnon to enter the fray in the second half, to gain important match time. “That was always our intention”, said coach Leoš Loos afterwards, “regardless of the score”. He continued, “The fact that we were up by five goals at the time was an added bonus as it meant that the heat was off us, so we could let the lads gain experience without being under any form of pressure”. However, it wasn’t all good news for Brook Street as both Matt Cocker and Krsto Grubić picked up injuries late in the second half. But the coach allayed any fears of long-term injuries by saying, “I’ve spoken with the medical team and they reckon the knocks are minor and both players will be available for the next round of the Cup, and probably even Saturday’s fixture against Nessie FC”. In that ‘next round’, Brook Street have been against Division IV side Ants Army F.C. With the match scheduled to take place at New Home Park nest Wednesday. “They look like they’re a very strong side, but we’ll be resisting the temptation to field our strongest team”, said Leoš. “This competition is all about gaining experience for our fringe players and reserves, and we won’t approach this game any differently”. Alex Clapperton – set to start on Saturday following Garabed Palasyan’s booking today. Two goals either side of half-time put paid to Brook Street’s Saltire Cup campaign this afternoon as Team Europe At Gleneagles ran out comfortable 4-0 winners. “I’ve no complaints at all”, admitted Leoš Loos afterwards, “we were beaten by a very good side who are going well in the league above us”. He added, “I’m only disappointed that Garabed has picked up a booking which rules him out of Saturday’s game against Highlands”. “That said”, he continued, “I would much rather he missed out this game rather than on against one of our title rivals”. “The reserves were fielded so that they could gain experience and nothing more. As it happens, Alex Clapperton will get his first league start on Saturday due to Garabed’s suspension, so there is one player who is gaining experience playing these games. I for one have no reservations in throwing him into the cut and thrust of the league”. So next week, it will be back to friendly matches for the reserves, but again Leoš was not too downbeat. “These are the kind of games we can try out new ideas. There’s no guarantee as to the quality of the opposition, but all we can do is go with the cards we’re dealt. What we are certain of though is that the matches will all be played at home again this season”.